Jean Lambert (front row, left of centre in image to the right) said: "Thank you London voters for returning me to the [European Parliament]. Great feeling." The European Parliament is one of the three main institutions involved in the creation of European law, along with the European Commission and the European Council of Ministers. It is the only directly elected EU body. If you are a London resident, you currently have eight Members of the European Parliament (MEPs). Every one of London's MEPs represents the whole London region. Jean Lambert was first elected as a Green Party Member of the European Parliament in 1999, and was re-elected in 2004 and 2009. London voters re-elected her again in 2014 with 9% of the vote. Nearly 200,000 Londoners voted for Jean - joining of the 1.2 million UK wide who voted Green in May 2014. Jean works alongside Keith Taylor, MEP for the South East, and Dr. Molly Scott Cato who was elected as the South West's first Green MEP in May 2014. They work on a wide range of social and environmental issues, from workers rights and access to healthcare to climate change and animal welfare. She is uniquely able to bring a radical Green perspective to European debates on issues that matter most to London. Find out more about Jean's work as a Green MEP here. In the European Parliament, Green Party of England and Wales MEPs work with other MEPs in the Green/European Free Alliance Group. To see a full list of MEPs in this group following the 2014 European Elections click here. Who were the London Green Party Candidates? 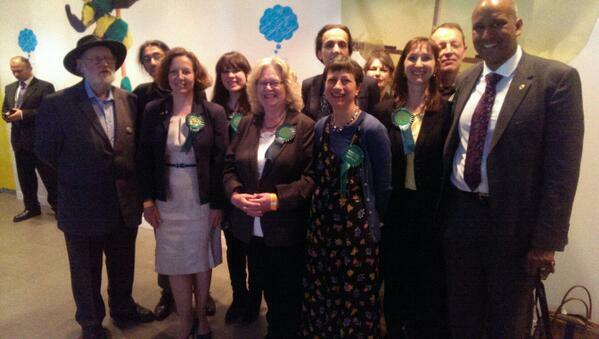 Here you can find out more about each of the London Green Party's candidates for the 2014 Euro elections. Jean Lambert has been the Green Party Member of the European Parliament for London since 1999, re-elected twice. She is a member of the Parliament’s Employment and Social Affairs Committee and the Civil Liberties Committee. Jean works on issues such as workers’ rights (including the Working Time Directive), free movement of EU nationals, including their access to work and social security: anti-poverty policy, including a recent report on the crisis and its impact on access to care , and also the promotion of new jobs in the growing environmental sector. She has also been involved in developing EU legislation covering asylum, immigration and child-protection measures. She is currently Chair of the Parliament’s Delegation for relations with the countries of South Asia, many of which are directly affected by climate change. Jean is involved with a number of all-party groups and organisations both in Brussels and London working on the promotion of equality and diversity and is a member of Liberty’s Council. She is a strong advocate of reproductive rights. A long-standing member of the Green Party, she has chaired the Party Executive and been a Principal Speaker, before the Party adopted a formal Leader. Born in Essex, she lives in Walthamstow and was a teacher in the Borough’s secondary school sector for a number of years, teaching English, French and Drama. Caroline Allen has lived and worked as a vet in North and East London for the last ten years. Caroline is an active campaigner; most recently campaigning on tackling dangerous levels of air pollution, making streets safer, protecting green space and civil liberties and holding councils to account on affordable housing targets. Caroline was a recipient of the the Clean Air in London Award 2013 in recognition of her success in raising awareness of air pollution and its dangerous health effects and campaigning for action in Islington and across London. Caroline is the Green Party Spokesperson on animal issues; something that is very important to her. Tackling food poverty and reforming our broken food system is also a priority for Caroline. Working for a small local business Caroline understands the pressures such businesses face and the benefits they bring to the local economy. Caroline joined the Green Party seven years ago because she believed it was the only party offering an honest vision of a better future; not just for the few and the fortunate but for all of us. Haroon Saad has, for the greater part of his life, been involved in organised politics. Haroon was a Labour party member and was elected as ward councillor for the city of Bristol. In this capacity he also became Chair of the Community and Economic Development Committee. Haroon therefore has considerable experience of campaigning and also of being an elected representative. Haroon has worked in local government in Bristol, London, Birmingham and Amsterdam. He is currently Director of a not for profit European Network called Local Urban Development European Network. LUDEN is an independent network which focuses on key transition issues facing European cities. Dr Shahrar Ali trained as a biochemical engineer then as a philosopher. His PhD from UCL analysed the morality of lying and deception, with special reference to public life. He entered green politics after working as a researcher in the European Parliament. He is author of Why Vote Green, an impassioned call for green politics in the 21st century. He has been a vocal critic of successive governments' assault on civil liberties through abusive anti-terror legislation, such as Guantanamo and rendition. Danny works as Constituency Co-ordinator for Jean Lambert, London's Green MEP. He has sat on the Green Party’s national executive and been the Party's Policy Co-ordinator. A Hackney resident for 17 years, Danny has campaigned on economic, social justice, environment and animal protection issues. A committed European, internationalist and vegan, Danny is also Secretary of Animal Aid and sits on the Green Party's International Committee. Croydon born and bred, Tracey’s career went from a Dance degree via working in the family hotel to becoming a qualified and experienced project manager in the energy sector. As mother of 2 young children she knows the pressures parents face. An experienced campaigner on environmental and animal rights issues, including sustained involvement with the Croydon Stop The Incinerator campaign, she has also championed health issues - including 3 years on the Scrutiny sub-committee for health. Violeta Vajda is a community and political activist and a doctoral researcher based at the University of Sussex and the Institute of Development Studies, working to end racism against Roma people throughout Europe, but especially in Romania and the UK. Violeta’s professional background is in international development, mainly focused on the Balkans and Eastern Europe, and she currently works as a media analyst. She is closely connected to immigrant communities living in London, as well as acting as a trustee and director of Volunteers for Mental Health a UK based charity working towards better care for psychiatric in-patients in Romania. Violeta is Hungarian and Romanian and lives in London with her mother and her 6 year old son. Amelia brings a range of experience to the campaign with a working knowledge of green jobs, community engagement, carbon footprinting, conservation and digital inclusion. She also has an MSc from Imperial College in Environmental Technology and is a keen “End Ecocide” campaigner. Many thanks to our supporters and members for providing these translations - please email us if your language is not included and you would like to help us translate materials in the future.